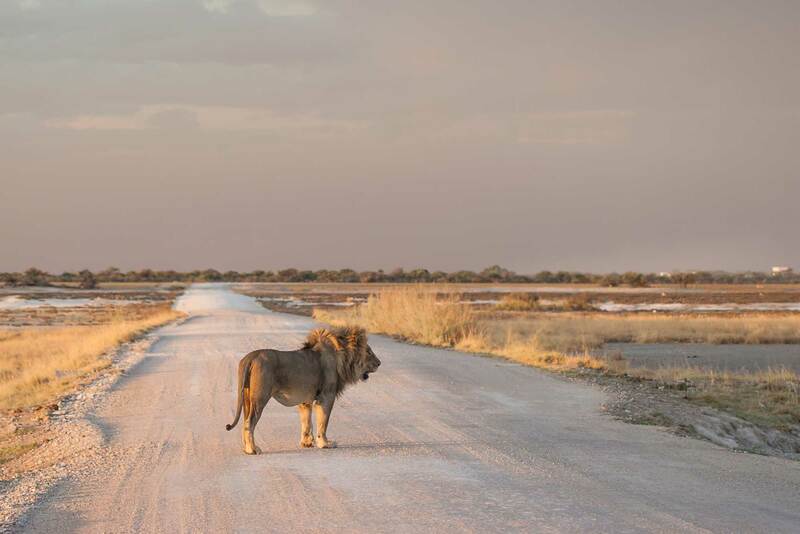 If you’re planning a trip to Namibia in the winter, then a visit to the Etosha National Park, Namibia’s jewel in the crown, should be high on your list. A ctually, you can expect good game viewing in Etosha at any time of the year, but wintertime is exceptional for several reasons. It stopped raining a few months ago, so the veld is dry by now and the game must visit the waterholes to drink, which increases your chances of seeing the big cats that hunt their prey. The summer grass has faded to yellow, and is flattened by countless hooves, making visibility excellent for spotting prey and predators, and all the smaller creatures that delight and surprise and the weather is so pleasant in winter that you could even swim in the pools at the camps! But let’s pause for a moment to consider. 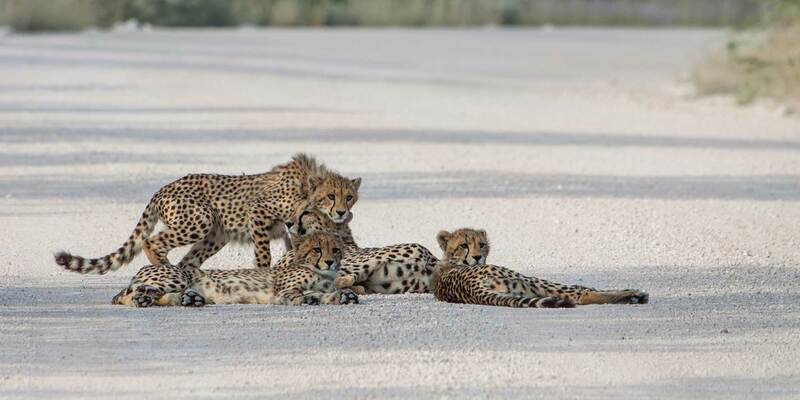 While Namibia is truly a big-cat country, with enough space and uninhabited areas for these magnificent creatures to still roam free, nowhere will you have a better chance of seeing lions, leopards and cheetahs in their natural environment than in Etosha. You do have a chance of sighting cheetahs on the gravel roads that criss-cross the country. You might even be lucky enough to spot a leopard crossing the road at night, as I have done. On an organised trip, if time and resources allow, you could also gain a glimpse into the lives of the legendary desert lions – an extraordinary opportunity for a few. 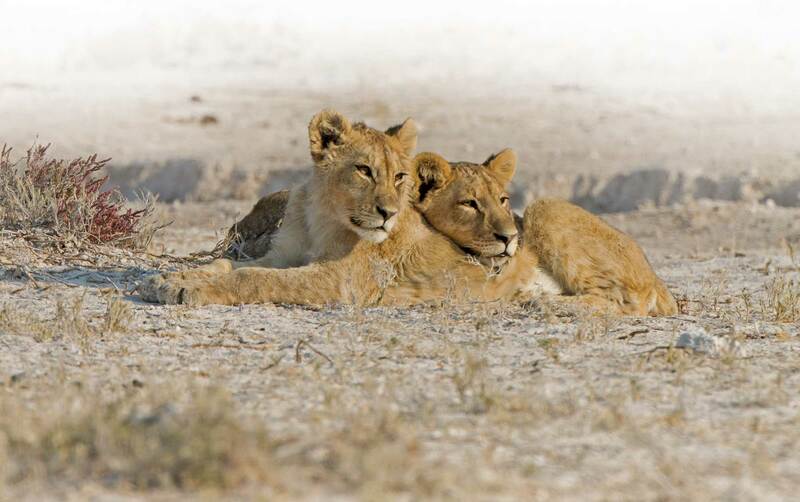 But for the best value and chances of sightings in winter, Etosha is the place to be. 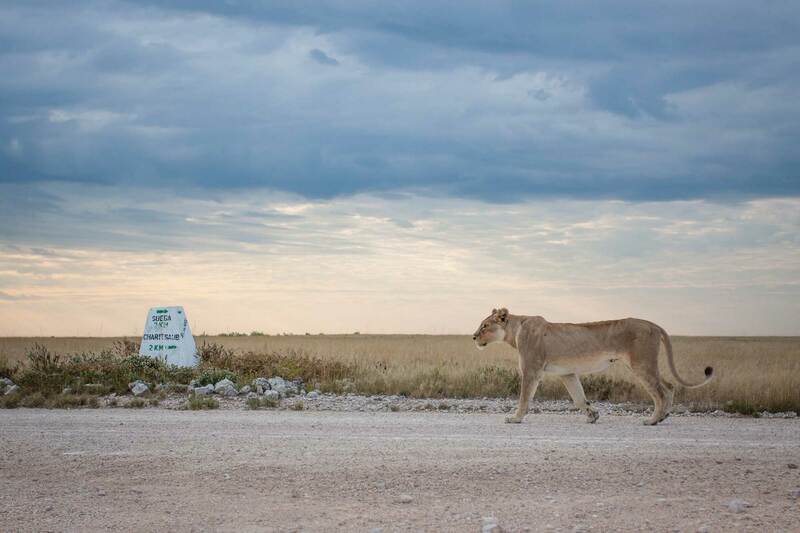 So where will you find big cats to photograph? 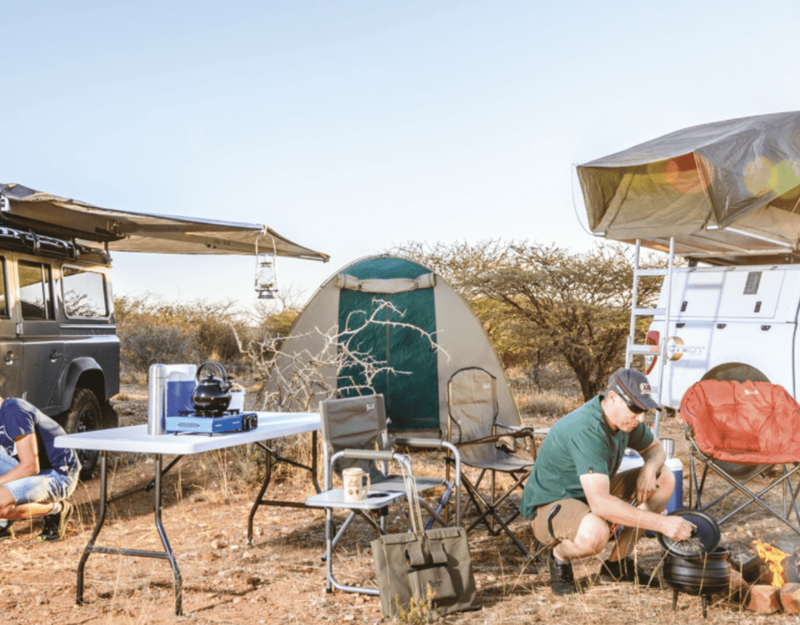 All the camps in Etosha are equally good for game viewing most of the year round, so perhaps two nights in each would give you a variety of opportunities and backdrops. Entering at Anderson’s Gate, first up is Okaukuejo. This area is renowned for good lion sightings, as well as for encountering cheetah. At Okaukuejo you can simply sit at the in-camp waterhole after dark and wait for lions to arrive. Needless to say, nothing is ever guaranteed! Or you could be out at first light and head north-west past the airstrip, to search the plains for lions. A good place to end up would be Okondeka waterhole, with its resident pride. They move up and down the edge of the pan as well as inland, but often just laze around under the acacia bushes on the left of the road, doing what lions do for about 20 hours a day – rest! Ombika waterhole near the Anderson’s Gate and the open plains to the east of this waterhole are a good bet for cheetah early to mid-morning. Nebrownii waterhole, just 7 km east of the camp, sometimes has lions, with great early-morning back-lighting and outstanding front lighting in the afternoon. When it’s hot, cubs sometimes take shelter in the culverts close by. Moving east to HALALI, you’ll find beautiful areas of vast open plains bordered by thick stands of Acacia nebrownii providing habitat for all the big cats. The Salvadora plains are an excellent bet, particularly in winter when the game congregates there to drink, as is Charitsaub by mid-morning. We have seen both lions and cheetahs hunting on these plains, and it’s always the first and last port of call on any trip. A highlight in 2012 was spotting a mother cheetah with three large cubs watching a male lion walking across the plains. He didn’t seem to notice them and it was quite a tense and amazing moment! I’ve always wanted to see a leopard in the big acacia tree at Charitsaub, but it’s not a place leopards frequent as far as I know. However, luck was on our side recently when we spotted a large male crouched in the grass near the waterhole, later crossing the road right in front of us! Do try and fit in the two detours in this area, north of Rietfontein (8 km) and south of Salvadora (14 km), as big cats, especially cheetah, are often spotted here early in the morning. Rietfontein is visited regularly by leopards and lions, but the waterhole itself is a bit far for photography. I love looking for leopards. Crawling along at 10 km/h searching for them is high on my to-do list! I once observed mating leopards in the bushes near the Nuamses waterhole. Hearing a third leopard rasp as it walked past these two, naturally put the mating pair on high alert. A minute later people driving past said they had also just seen a leopard at the waterhole more than a kilometre away! Talk about a ‘leopard-jam’… So make a point of driving slowly as you approach the waterhole, and scan the bushes carefully. Most of the leopards I’ve sighted were on the ground, and these cats are the masters of camouflage. I’ve often seen leopards crossing the roads leading to and from Halali camp, where you can expect a leopard any time of the day. Having personally notched up well over 80 daytime sightings in Southern Africa, I can verify that it’s simply a matter of luck, perseverance and really slow driving. The Moringa waterhole in the camp is often visited by a leopard just after dark, especially in the winter, so take a (quiet) blanket, a warm drink and settle in to wait. When you continue east towards Namutoni, your first stop (and this must be as early as possible) should be Batia waterhole, which was closed for a long time due to roads that had been washed away. On our first visit there since being re-opened, we came upon a mother cheetah and her two big cubs. We watched an amusing scene unfold as the young cubs tried to hunt a warthog but ended up being chased themselves! 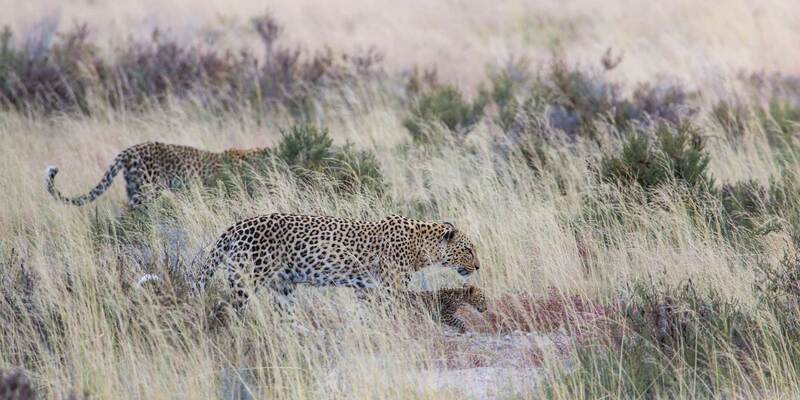 Batia, as well as the next waterhole, Okerfontein, is known to be frequented by cheetah, while females with cubs are sometimes seen between the two. The drive to Fischer’s Pan is interesting if done slowly, and can yield an array of smaller, more unusual species such as honey badgers and bat-eared foxes. Twee Palms could be your leopard spot on this drive, and there are sometimes lions hanging around in the bushes along the route. Kalkheuwel west of Namutoni is an excellent call for both lion and leopard, so should be high on your list. Chudop is well known for lions. It’s close to the camp and the waterhole is near the car park, making it a good spot for photography. Now that you know where to start looking, here are a few things to remember when planning your photographic trip. Get up early! Lions and leopards are on the move early after the night’s hunt, looking for a place to settle for the day. Besides, the light is best in the golden hour immediately after sunrise. Etosha has particularly harsh light and the golden hour seems even shorter here, so aim to be the first out of the gate. The last hour or so before sunset is also important when the nocturnal cats are starting to move. Have your camera unpacked and the settings correct before you leave camp. Make sure you have a high ISO and fast shutter speed to accommodate the low light and moving cats. You can always dial down the ISO as the sun comes up and the light improves. Don’t hesitate to shoot towards the rising sun. Using manual exposure, you can achieve some stunning rim-lit silhouette photos at first light here. Ask the guides who drive the park vehicles – they are helpful and knowledgeable – where the cats are. Check the sightings book in the offices to see where the cats have been spotted in the last day or so. Lions will often stay in the vicinity of a kill for a day or two. Talk to fellow visitors and share your sightings – it rarely becomes crowded in Etosha, so exchanging tips will not detract in any way from your viewing potential! And be sure to write your sightings in the books for others to enjoy. Read up on the basic knowledge and behaviour of the big cats beforehand ­– this will enable you to anticipate their likely actions. For example, do your cheetah hunting during the day, as this is when they can often be found out on the plains. Leopards generally keep to the cover of the wooded areas and will frequently drag their kill into a tree to protect it from scavengers. It’s important to take some shots of the cats in their environment – for example, a photo taken on the plains of Etosha will look profoundly different from one taken in Kruger or East Africa. Scale is important here. Share and spread your images and messages about big-cat conservation. Awareness is crucial for the conservation of these species. These days when photographing endangered wildlife it’s a good idea to disable the GPS function on your camera beforehand. Poachers have recently started locating our threatened species by accessing the data on images that you post on the Internet. WHY ARE NAMIBIA’S BIG CATS SO IMPORTANT? Big cats are amongst the iconic species symbolising Africa and its wildlife. They play an essential role in maintaining ecosystems, and by conserving them in their natural habitat, we protect other animal and plant species. The populations of all these cats are declining rapidly due to uncontrolled human population expansion and the resulting encroachment on their habitat, which reduces their natural prey. Poaching, disease, unsustainable hunting, and persecution by farmers and herders are just some of the many challenges they face today. Figures on how many lions there are today in Africa vary widely, but what seems clear is that their numbers have decreased by two thirds in the last 50 years. Wildlife film-maker Dereck Joubert estimates there are only about 20,000 lions left in wild Africa. According to the AfriCat Foundation, there are between 500 to 800 wild lions left in Namibia, distributed between the Kunene Region, Etosha and the north-eastern regions of Khaudum, the Nyae-Nyae Conservancy and the rivers bordering Botswana. 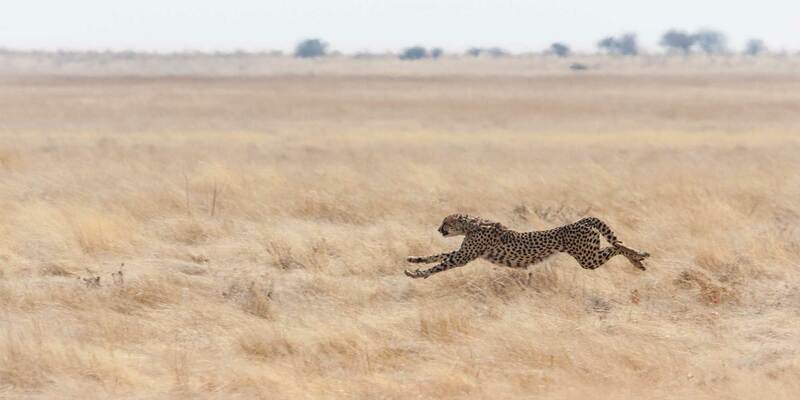 In Africa some 9000 cheetah still live in the wild today. Of these Namibia has the largest population – a conservative estimate puts the figure at around 3,000 – of which 95% live outside protected areas on farmlands. There are no reliable figures on how many there are in Etosha – a recent estimate puts it at less than 50, and becoming fewer every year. Cheetahs are just not able to compete with lions for prey, and are prone to the naturally occurring disease anthrax, contracted mainly by eating infected prey. Most leopards also live outside protected areas and are still often killed by farmers and trophy hunters. It’s extremely difficult to estimate numbers, and this is part of their predicament. Although they are opportunists and adapt better than other big cats to encroachment, it is not at all clear how well they are coping. I often say that we visit the parks to enjoy all the wildlife there, and I mean exactly that, because there is such beauty to be found in the smaller creatures, not least of all the birds, and in the great variety of trees, grasses and flowering plants, but when I recently had the opportunity to spend three hours watching three leopards, I realised that this is the ultimate thrill and privilege and probably the reason why I return again and again to the bush, and especially to Etosha. I simply don’t want to imagine our big-cat country without these majestic, intelligent creatures, and neither should you. WHY OUR LIONS LOOK SO GOOD! 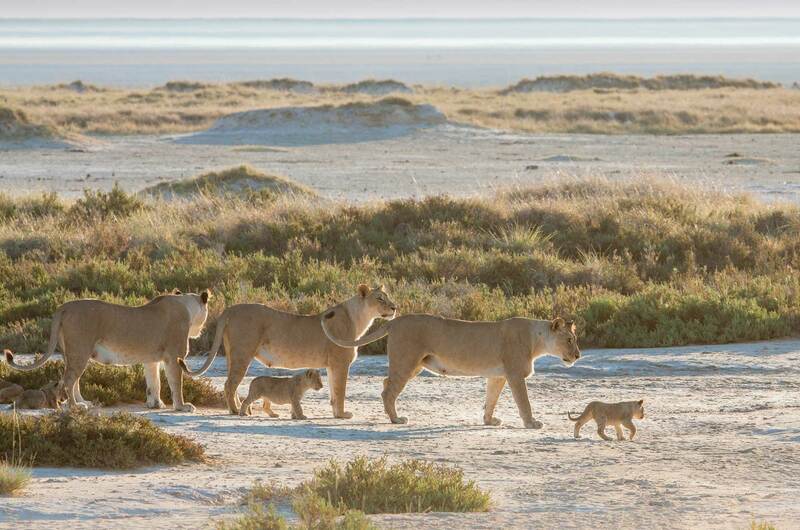 Etosha’s lions are one of only a few African populations considered to be free of FIV (feline immuno-deficiency virus), canine distemper and tuberculosis. We no longer have the luxury of time when it comes to big cats. They are in such a downward spiral that if we hesitate now, we will be responsible for extinctions across the globe. If there was ever a time to take action, it is now. This article was published in the Winter 2014 edition of Travel News Namibia. Luck is certainly key. On two visits I have never seen lions near Okendeka or Sueda areas. But was stunned to get loads of females and a few males at Klein Namutoni. Other than that, on first trip saw pair of lions mating near Dolomite and male at Okakuejo waterhole in the evening; one distant leopard from Dolomite. Hope for more on trip next year.